On the first Friday in February, Dalhousie takes the day off for Munro Day, but how many Dalhousians know the origin of this holiday? 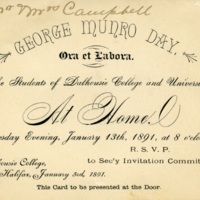 Munro Day was created by Dalhousie students in 1881 to honour George Munro, a wealthy publisher whose generous donations helped Dalhousie grow and succeed. George Munro was born on November 12, 1825 in Pictou County, NS. He was a schoolteacher and then principal for many years in New Glasgow and at the Free Church Academy in Halifax before moving to New York in 1856. He started working in the book publishing business in New York, and opened his own publishing company in 1863. He also got involved in real estate and other business dealings and became quite wealthy in New York. His son had attended Dalhousie, and he always kept ties to Nova Scotia. In 1879 he visited his brother-in-law John Forrest in Halifax, and was told about the dire financial state of Dalhousie University. He agreed to endow a Chair in Physics in 1879 at $2000 per year (a large sum in 1879). He then endowed a Chair in History (1881), English Literature and Rhetoric (1882), Law (1883), and Philosophy (1884). He also gave money to create the Munro bursaries for students at Dalhousie – half of the first 25 female graduates from Dalhousie were supported financially by Munro bursaries. 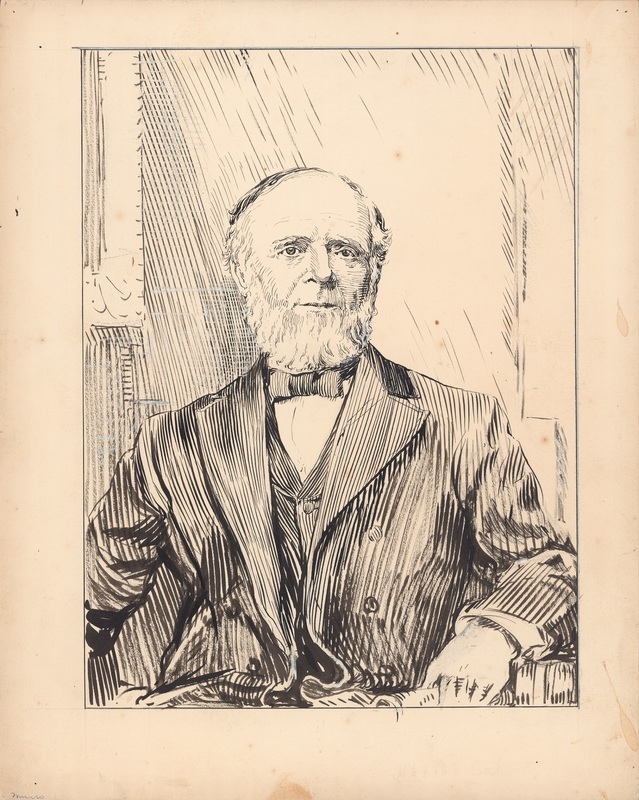 From 1879 to his death in 1896 he gave $333,000 to Dalhousie ($8 million in modern terms). Dalhousie created a school holiday in his honour, Munro Day, which is still celebrated every year. George Munro passed away on April 23, 1896 at the age of 70. Today, most students see Munro Day as just another day off, but in decades past it was a day for dances, parties, awards, and other celebrations. Click on the image thumbnails to view full-size. When Munro Day was first founded, it was often celebrated by taking a sleigh ride to a hotel in Bedford, where a dinner and many toasts would take place. 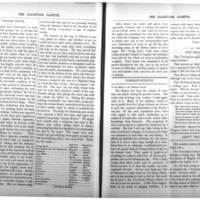 This article from the January 26, 1883 issue of the Dalhousie Gazette ("Our Sleigh-Drive") describes one such celebration. Dances and parties (or "At Homes") were a common occurence on Munro Day. 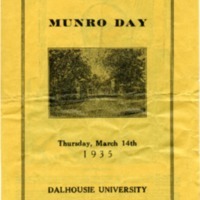 During the 1930s-1950s, Munro Day was celebrated with a full day of sports, musical performances, award presentations, the presentation of the new students' council, and a dance. This program shows a typical Munro Day schedule. In the 1950s, Dalhousians also celebrated Munro Day by crowning a Campus Queen. 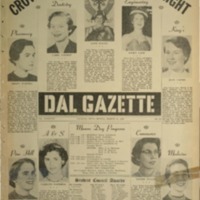 The front page of the March 13, 1956 issue of the Gazette features photographs of the lovely contestants, as well as the Munro Day program.